A BIG WIN AND SPANKING NEW DIGS FOR ADLER PUBLIC AFFAIRS! • We've moved -- and encourage you to come visit our new location in Signal Hill (be sure to update our contact information which is listed below). 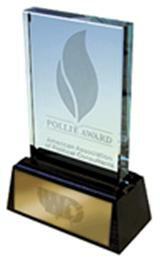 • We've just won our first Pollie Award -- the Academy Award for political campaigns and consultants! The American Association of Political Consultants has awarded APA a presitigious Pollie Award for our Greetings From Carson mailing, which was produced in 2008 as part of Carson Mayor Jim Dear's landslide defense of a recall campaign mounted against him. The Pollie Awards, announced in Washington, D.C. last week, are the most prestigious awards in the political and public affairs industry, recognizing the "best of the best" in the political and public affairs universe. Winning an award like this always gets us pumped up and motivated for our next win – and the opportunity to conceive and execute the next award-winning electoral victory for our clients. Click here to view our Pollie-winning entry!